The last deadline for registration of existing chemicals will be 31st May 2018. This deadline concerns SMEs that manufacture or import substances in low volumes between 1-100 tonnes per year. It is expected that up to 70,000 registrations will be prepared for 2018, which is 3 times the amount previously prepared for either of the previous deadlines. Many of the registrants are expected to be inexperienced and located outside the chemical sector. The REACH Regulations aim for a high level of protection of human health and the environment, including promoting alternative methods for assessments of hazards of substances, as well as free circulation of chemicals in the European market, while enhancing competitiveness and innovation. REACH provides a system of registration for generating documenting and disseminating this information. This database is to provide accurate knowledge on properties, uses and resulting exposure to chemicals will allow proper risk control measures to be designed. The most hazardous substances and those manufactured or imported in the largest quantities were registered first, in 2010, followed by the registration of chemicals in 2013 that were manufactured or imported in the next largest quantities. With the registration of chemicals manufactured or imported between 1-100 tonnes per year per company in 2018, this will mark the finishing point of the data gathering process on substances in the European market and the completion of the most comprehensive chemicals database in the world. If the registration of all chemicals available in the European market is successfully carried out then REACH will result in a large scale improvement of human health and the environment in Europe. This will be achieved through the increased knowledge used by companies in their everyday operations and stored in European Chemicals Agency (ECHA)’s database for authorities to use in regulatory risk management actions. The REACH Roadmap was published earlier this year. 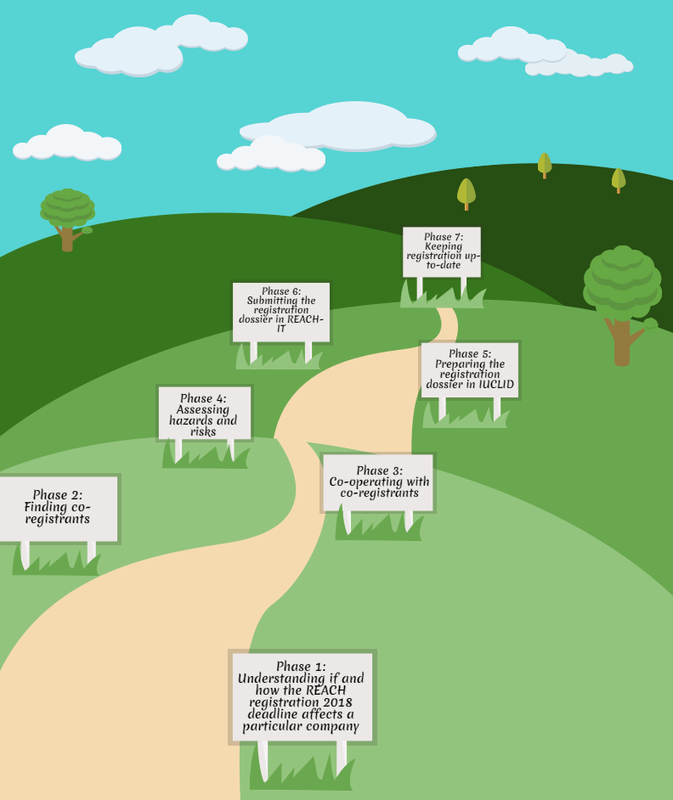 It outlines the relevant milestones within each of the 7 phases for a successful registration process. 2014 – Publications of one-stop-shop web page, in all EU languages, for 2018 registration information on the ECHA website. June 2014 – Checklist for selecting a good consultant. 2015 – Simplified/scoped ECHA Helpdesk replies. 2015 – Reviewed Q&A database on ECHA’s website with an enhanced ability to find relevant information for phase 1. 2015 – Webinar ‘How does the REACH 2018 registration deadline affect you?’ – Giving clear advice to companies to access whether the deadline affects to them and how. 2015-2017 – Outreach campaign for the 2018 registration deadline, where joint information campaign together with national helpdesks and ASOS forms the backbone. 2016 – Single point of entry for all questions to ECHA. 2015 – Methodology established for substance sameness. 2015 – Potential review of the guidance on substance identification and naming of other types of material for addressing substance sameness. 2016 – Improved accessibility to finding co-registrants. 2014-2018 – Industry led drafting and publication of sector-specific guidance on substance identification with support from ECHA. 2014 – Publication of ECHA data-sharing dispute decisions and assessment criteria. 2015 – Publication on task sharing and practices in a SIEF, including promotion of the DCG document, ‘Recommendation on sound SIEF Management’. 2015 – Publication of support material. 2016 – Provision of online trading for data-sharing negotiations. 2014-2017 – Publication of DCG recommendations. 2015-2016 – Publication of relevant updated guidance. 2015 – Strategy for supporting the 2018 registrants in relation to REACH Annex III. 2015 – Publication of the principles of the human health Read-Across Assessment Framework (RAAF). 2016 – Practical guide for registrants of chemical substances for 1-10 tonnes. 2016 – Chesar 3 and related training activities. 2016 – Simplified access to guidance helping SMEs. 2014 – New version of IUCLID specified for improved data structure. 2016 – New and revised dossier preparation tools (IUCLID 6, Validation Assistant (including completeness check) and manuals. 2016, 2017 – Training (update) of national helpdesk correspondents on dossier preparation. 2015 – Implementation of the plan regarding the completeness check tool and process, as appropriate, in particular for checking safety information. 2016 – REACH-IT ready for the 2018 registration deadline (including multilingual support as appropriate). 2016, 2017 – Training (update) of national helpdesk correspondents on dossier submission. Milestones for the post-2018 period will be defined later, as part of the process to build the ECHA multi-annual work programme for 2019-2023.